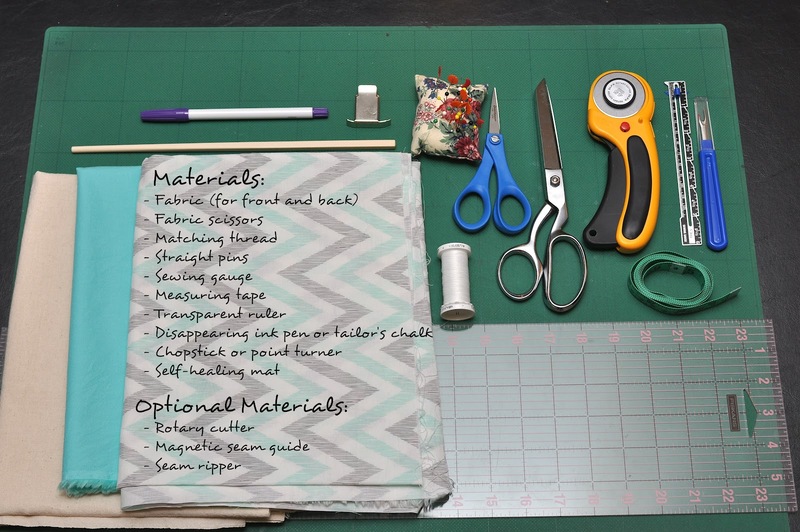 I discovered this amazing website called Craftsy about a month ago, an interactive platform where you can sign up for a ton of craft-related courses taught by experienced instructors. I learned how to make this french seamed envelope pillow from the course, Sewing Studio: Fashion Fitting, Home Decor & More taught by Diana Rupp. I'll show you how I did it step-by-step so you can follow along and create your very own one too! What is a french seam? A french seam is a double sewn seam where the raw, frayed edges are enclosed within the second seam. Gives the project a nice, clean look. 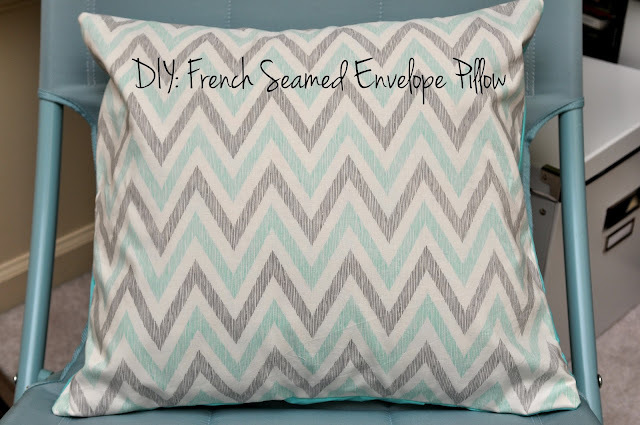 What is an envelope pillow? This pillowcase has two overlapping panels in the back for a hidden opening for the pillow. You will need 1 yard of fabric for the front and back, each (you'll have some extra leftover). I also have a yard of muslin here since my pillow already had a pattern on it, and I didn't want it to show through my fabric. Make sure you wash your fabrics, dry, and iron them before you begin since fabrics tend to shrink after you wash them. 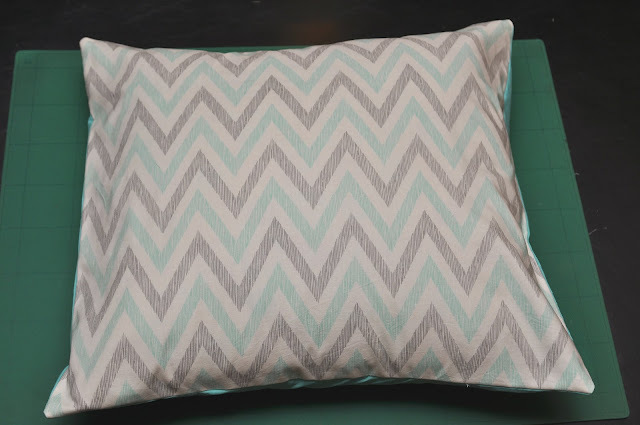 To determine how much fabric you need for the front and back, measure across the center of your pillow horizontally and vertically. 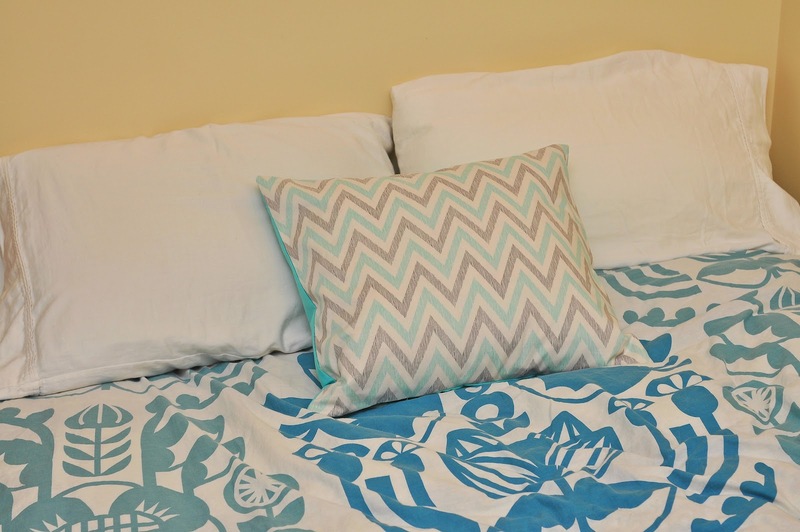 ​I was expecting my pillow to be square, but it ended up being 19" x 17" (length x width). Oh well... more "math" for me. Your front fabric should be 1" wider and taller than your pillow, so my front fabric was 20" x 18". 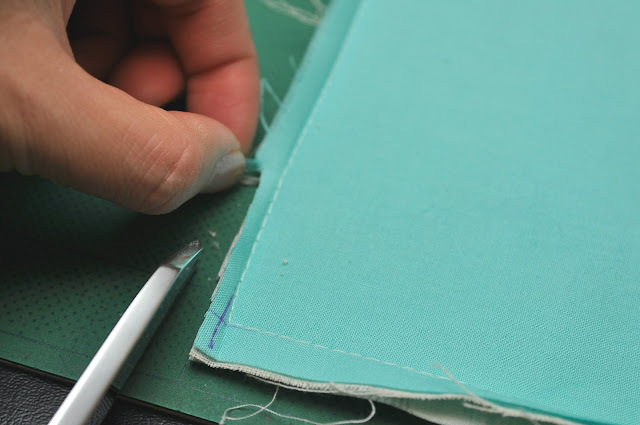 Find the selvage (the finished edge of the fabric) as that will be your straight edge guide. Since I want my fabric's zig zags to be horizontal across my pillow, I cut my length to 20" and my width to 18". 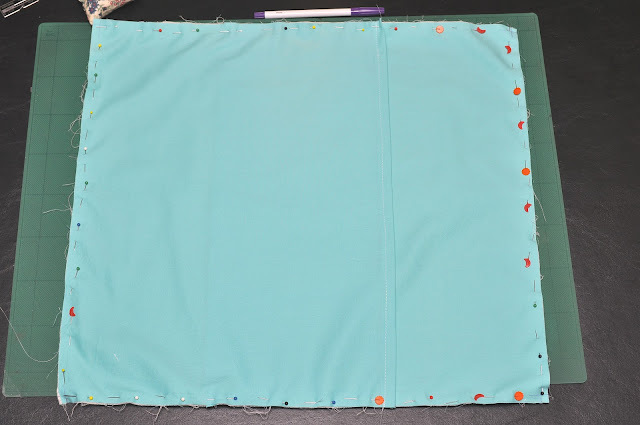 Flip your fabric to the other side and draw out the entire rectangle onto your fabric. Double check your measurements. Use a rotary cutter and ruler or your fabric shears to cut out the front fabric piece. At this point, I measured and cut out the same sized piece of muslin and sewed the 2 pieces together with a 3/8" seam allowance. Now my front piece was less see-through. There will be 2 pieces of fabric for the back. The width will be the same (18"), but the length should be 75% of the front piece's length (0.75*20" = 15"). 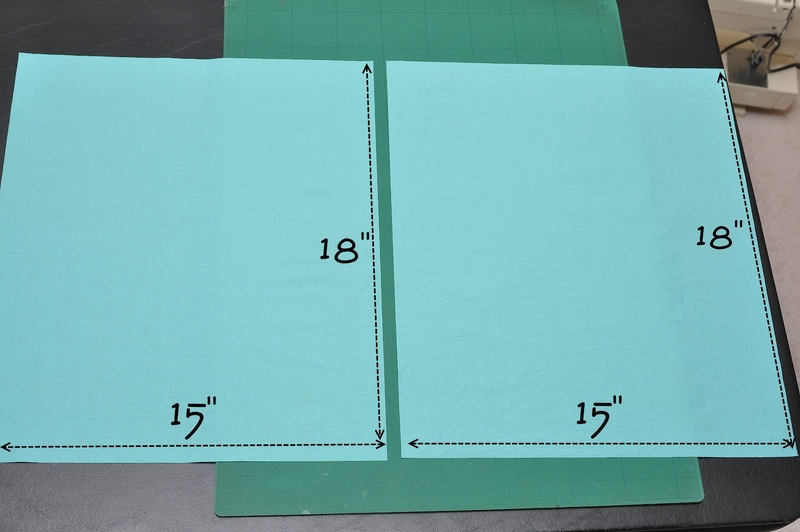 So, I should have 2 pieces of fabric that are 15" x 18" each. 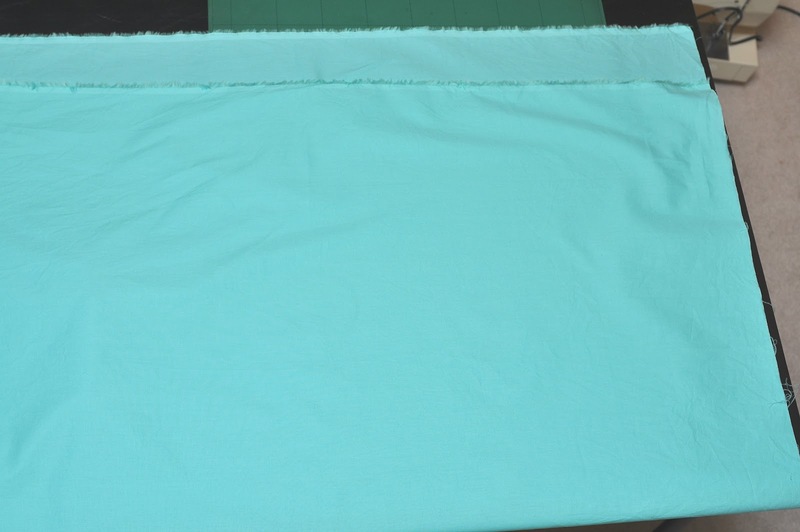 To make it easier, so you only have to cut once, fold your fabric over so that both selvages are at the top. Measure and mark the rectangle once, and cut out the backs just like you did the front. Choose a side to be the ugly/wrong side and mark that side with an "X". (The inside edges will have the "X".) The edge with the "X" is where you will do the double turned hem in the next step. A double turned hem is where the edge is folded over twice so the raw edges are concealed. 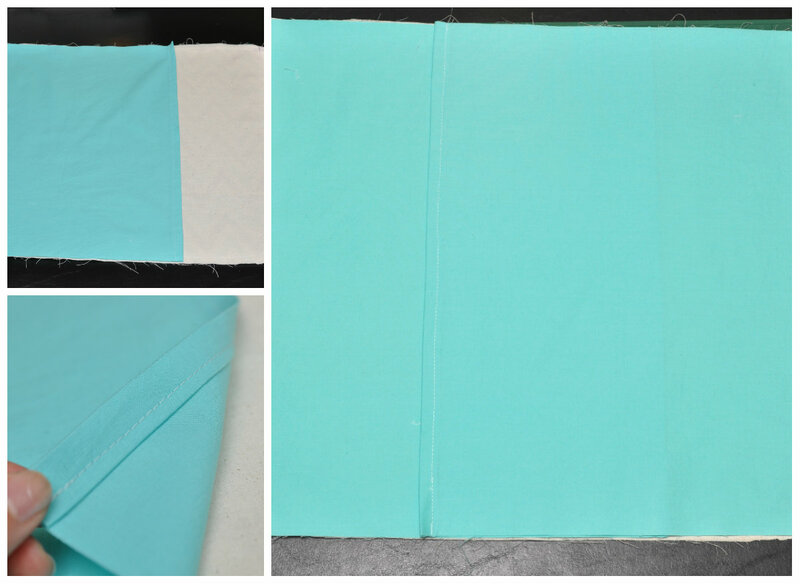 For both pieces of the back, double turn hem the edge with the "X" with a 1" hem allowance. Now, pin parallel to the seam line and closer to the inner fold with the heads toward you (for easy removal). You want to do an edge stitch at 3/8" from the folded edge. Don't forget to back stitch at the beginning and the end. 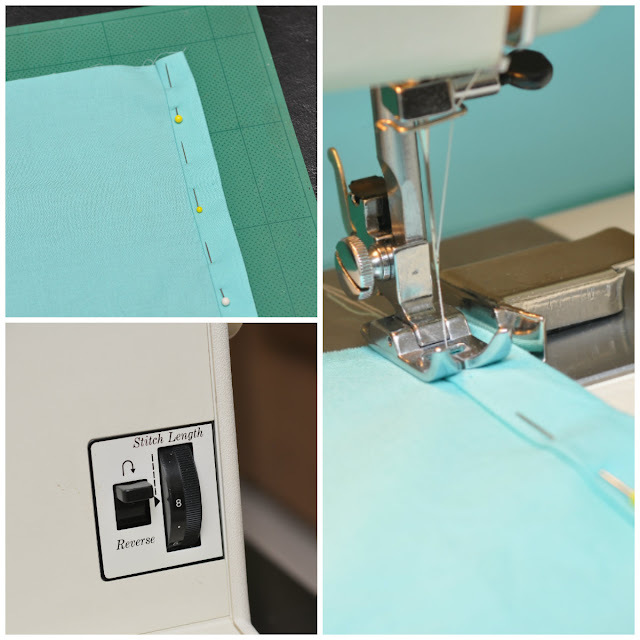 I used a magnetic seam guide to help keep a straight stitch at 3/8". Once you're done hemming both back pieces, press them on both sides to set the stitching. Lay down your front piece first, with the pretty side down. Then lay one of your back pieces down on the left with the hem to the inside. Then, the right side of the back piece, hem to the inside. Whichever hem you think is the prettiest of the back pieces should go down last. 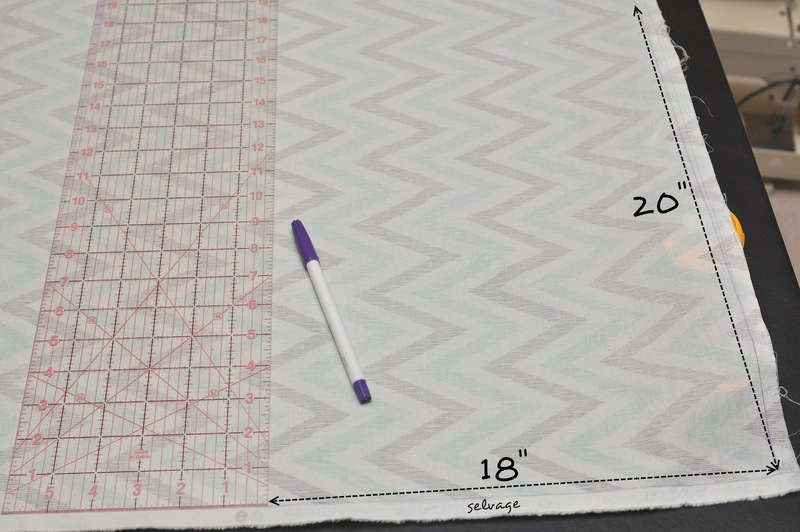 Use your ruler to mark where you'll be pivoting at each corner, so a "plus sign" at 1/4" from the edge at each corner. Pin all the edges with the pin heads towards you. Start off at the intersection of one corner at the 2/8" mark (no need to backstitch since you'll sew over it again when you come around to the beginning at the end). Now for the pivoting part- Once you sew along an edge, slow down until your needle is at the intersection (the plus sign you drew) of the next corner. If you're afraid you're going to miss it, you can manually hand crank the turn wheel (towards you) until the needle reaches the intersection. With the needle IN the fabric, lift the presser foot, rotate the fabric, then lower the presser foot, and continue sewing for one continuous stitch all the way around. At the very end, make sure you backstitch. Press the seams open along all 4 sides. This helps the thread to sink into the fabric and gets rid of any unevenness in tension. Then press the seams closed again. I know, it's weird- why iron them open if you're going to iron them closed again?? According to Diana Rupp, you iron them open so when the project is flipped inside out, the project lays flat along the seam. 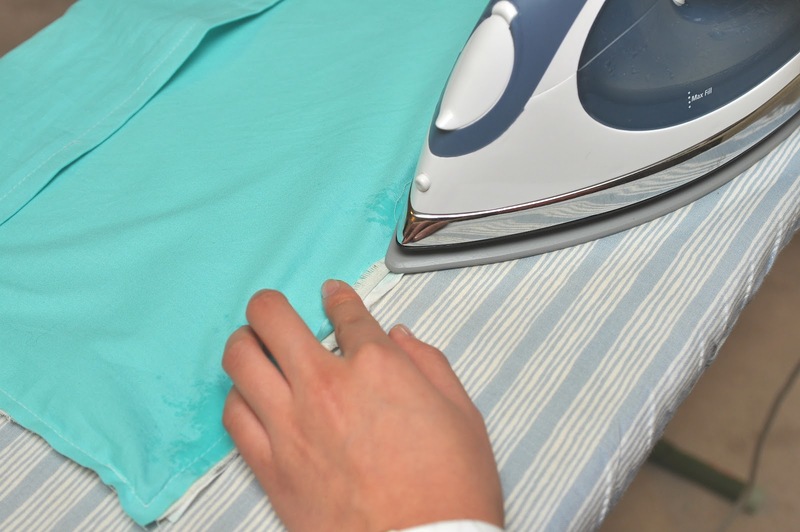 You iron them closed again so it's easier to trim for the next step. Place your project onto the self-healing mat and trim away the excess fabric as close to the seam as possible. You want this excess fabric to be really short so that when you do the french seam (flip it inside out and sew another seam), the edges won't stick out. Believe me, I learned this the hard way! After you've trimmed all sides, turn your project inside out and use a chopstick or point turner to push out the corners. Mark at 1/4" at each corner again. Sew along all 4 edges at the 2/8" mark. 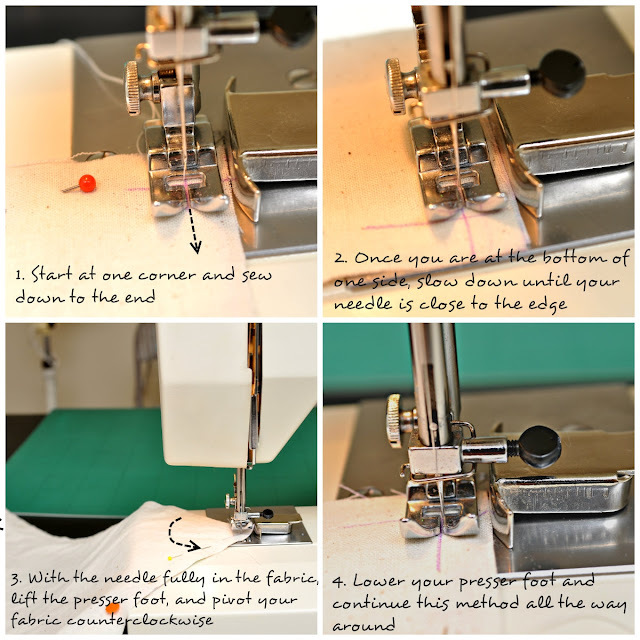 You are sewing in the raw edge of the fabric you trimmed earlier in this step. Turn the pretty side of the fabric out and use the chopstick to push out the corners. Press the back and front seams and all over. Last time we press, I swear! 11. Stuff Your Pillow In... and you're DONE! love it, stephu! and the colors are so hip and now. is that your bed spread too?